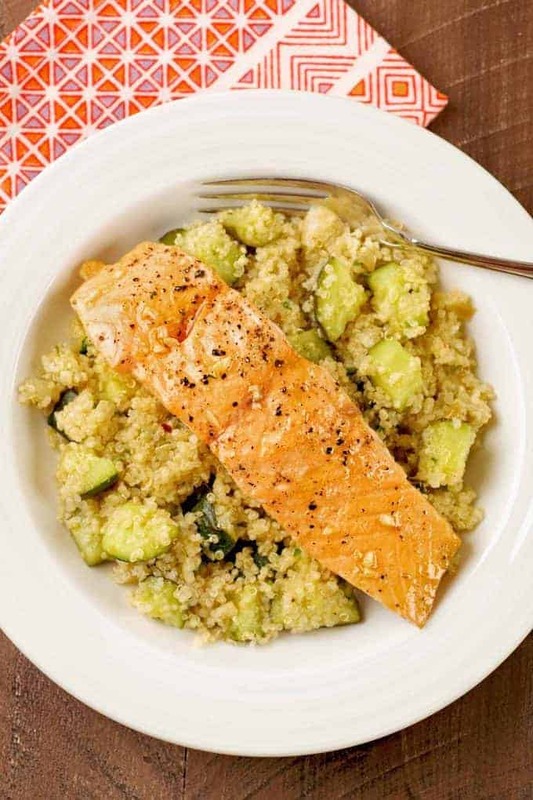 Paired with a combination of quinoa and roasted zucchini, these quick-cooking honey and garlic glazed salmon fillets make an easy, healthful choice for a one-dish, mid-week dinner. 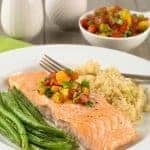 Salmon has so much natural flavor that the addition of a few simple ingredients like lemon, honey and garlic are all that’s needed to prepare the fillets for the oven. 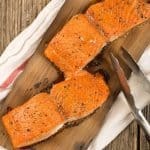 For best results, we recommend cooking the salmon to a medium doneness, and high-heat roasting is one of the easiest ways to achieve this. What this means is that the salmon should still be slightly translucent in the center when you take it out of the oven. The residual heat in the fish will finish cooking it to perfection within a few minutes. 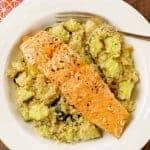 Served on a bed of quinoa and roasted zucchini, these honey-garlic glazed salmon fillets make a fast and healthy one-dish dinner. Preheat the oven to 425°F and coat two medium rimmed baking sheets with nonstick spray. 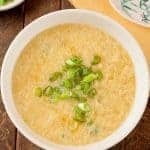 Combine the honey and garlic in a small bowl and set aside. Season the salmon fillets on both sides with salt and pepper, drizzle with about half of the lemon juice and arrange in a single layer on one of the prepared baking sheets. 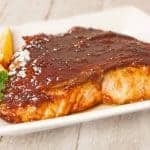 Spread a portion of the the honey mixture over each salmon fillet and set aside. Quarter the zucchini lengthwise, cut into 1/2-inch pieces and spread on the other prepared baking sheet in a single layer. 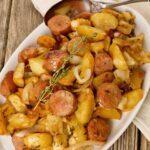 Season with salt and pepper and roast until tender, 15 to 18 minutes. While the zucchini roasts, cook the quinoa. Add the chicken broth to a medium saucepan, bring to a boil and stir in the quinoa. Lower the heat, and simmer the quinoa until all the broth is absorbed, 12 minutes. Remove from the heat and fluff with a fork. Combine the cooked zucchini with the quinoa, cover to keep warm and set aside. Place the fish in the oven and roast for 8 to 10 minutes. Place a serving of quinoa and zucchini in each of 4 shallow bowls. 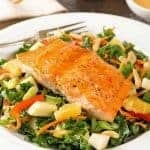 Top with a salmon fillet, drizzle with the remaining lemon juice and serve immediately. 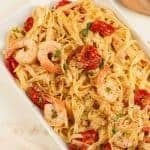 This is a great one dish healthy and tasty meal, It comes together pretty fast and we enjoyed it so much ! I will make it again. We’re always looking for new ways to serve salmon because it is a healthy choice. Glad you liked it.